The giveaway is now closed. Thanks for entering! With summer’s imminent (and seemingly early) arrival, I’m looking forward to festivals, fireworks, or just long, dreamy weekend afternoons. Now that baby Isabelle is getting older and more fun, I’m eager to take her out and about and introduce her to the joys of summer. 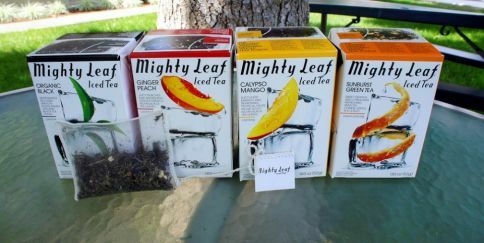 Hot summer days mean iced tea, so I was pleased to be contacted by Mighty Leaf Tea Company about their new tea bags for brewing iced tea. I was sent a sample of Mighty Leaf’s Iced Teas along with a Takeya iced tea pitcher for flash brewing some iced tea. The tea comes in extra large pouches that are portioned to brew about a half gallon of tea. After brewing a few minutes, you simply add ice to flash chill, and instant iced tea. I like the pitcher – I could have used it at the red egg party – and it does make creating, serving, and storing iced tea simple. What else can you do with the tea? You can make tea ice cream, like I did. This time, I wanted to make a separate dish to go with the iced tea. In musing over what might go with a glass of iced tea, I was reminded by the husband of how excited he is now that it’s peach season. Since one of the iced tea flavors was Ginger Peach, I figured a peachy dessert was in order. After running through a few possibilities, I settled on a simple little cake that fits the lazy, no-fuss languor of summer perfectly. This classic almond cake is made delectably rich and moist with almond paste and butter – it’s like the most heavenly scented pound cake ever. The crumb is fine and dense; it cuts beautifully and would work wonderfully as a layer cake. And the batter can be made entirely in the food processor; this is another hubby-friendly recipe that he has no fear of making himself. 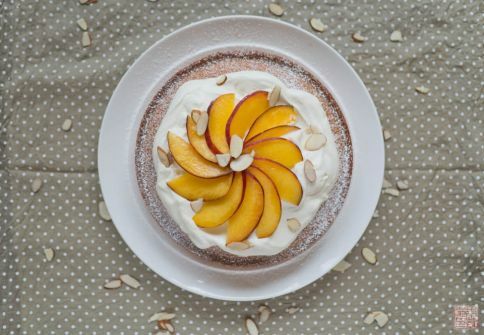 I debated over adding peaches to the batter but I opted instead to add them on top to emphasize their freshness and ripeness (for a similar recipe with apricots in the cake, see here). A little dusting of confectioners’ sugar is all the quick embellishment you really need, but if you want to get a little fancier, a topping of whipped cream and crème fraîche (I like adding crème fraîche for the increased body and stability it gives – it makes the whipped cream more substantial and less finicky) provides a sweet backdrop to display summer’s peaches in all their golden lusciousness. 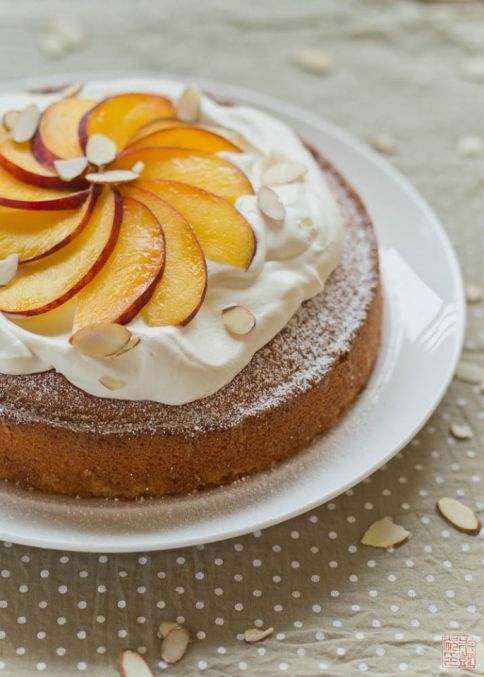 Husband noted that the peach-to-cake ratio was a little low for his tastes, to which I replied that there’s nothing wrong with adding a pile of peaches on the side of your piece of cake. I love this cake – it’s unpretentious, shows off any fruit beautifully, and works equally well as an afternoon snack or an alfresco dessert after dinner. The best part is that it’s easy to make again, and eat with more fresh fruit from the farmers’ market. To help you welcome summer, I’m pleased to give away an iced tea set from Mighty Leaf, the same as which they sent me, containing a box each of their four iced teas, a Takeya iced tea pitcher, and a Takeya glass water bottle. 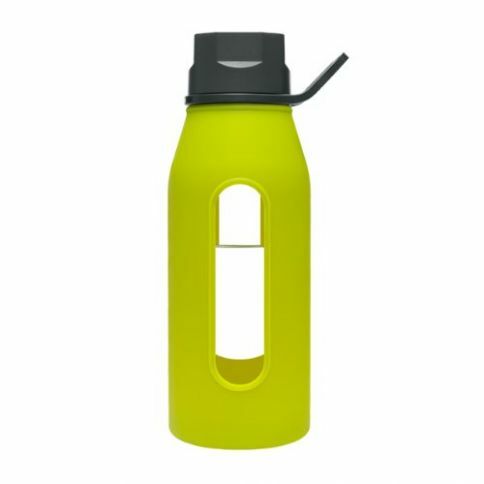 I think the water bottle is my new favorite thing: it’s sturdy, elegant, and portable all at once. 1. Leave a comment on this post with your preferred iced tea flavor: Black, Green, Ginger Peach, or Calypso Mango. 2. For an additional entry, you can “Like” both my Facebook page and Mighty Leaf’s Facebook page. Leave a second comment here if you’ve done both. 3. For an additional entry, you can follow both me on Twitter and Mighty Leaf on Twitter. Leave a third comment here if you’ve done both. The contest will run until June 25 and I’ll randomly select and announce the winner before the end of the week. Good luck! I was sent an iced tea brewing kit by Mighty Leaf for my review. All opinions in this post are my own. Preheat oven to 350 degrees F. Butter an 8 inch round cake pan (at least 2 inches high, I prefer 3 inches high). Combine almond paste and sugar in a food processor and process until soft and well combined. Add butter and process until fully combined. Add eggs and process until combined. Add flour, baking powder, and salt and process until fully combined. The batter should be smooth and thick. Pour batter into prepared pan and bake for 40-45 minutes, until a toothpick inserted comes out clean. Let cool on wire rack for about 5 minutes, then unmold and let finish cooling. Sift confectioners' sugar over the cake. Combine cream, crème fraîche, and confectioners' sugar in a stand mixer with the whisk attachment. Whip to soft peaks. Spread over the cooled cake. Wash and slice the peaches. Arrange slices over the top of the cake and serve any leftover slices with the cake. Green tea would be my the tea of my choice. I love an almond cake, but I’ve never tried adding almond paste to the batter. I bet this cake would be equally delicious with some poached citrus, which is what is filling our farmer’s market stalls in the wintery Southern Hemisphere. This cake is gorgeous! Love the look of the peaches on top 🙂 I like black tea! I love ginger peach! That cake looks yummy too! Calypso Mango! Thanks for this giveaway! It’s great! 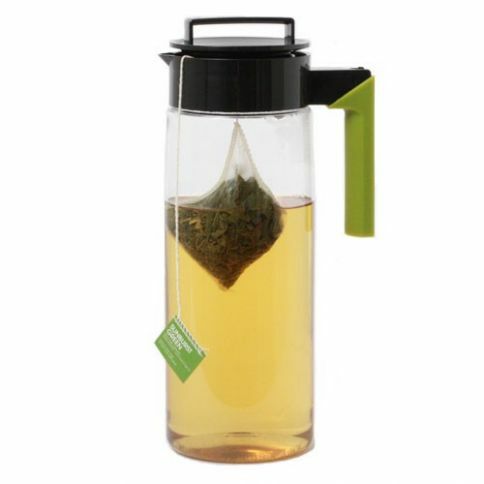 Contest Giveaway: I am an avid fan of green tea. Thank you so much for the giveaway! Contest Giveaway (#2): I liked your and Mighty Leaf Tea’s Facebook page. That is such a lovely cake! I’m just in love with staring at it. Contest Giveaway (#3): I am following you and Mighty Leaf Tea on twitter. My favorite iced tea is mango. Very refreshing and light. Unlike hot tea, I love flavored for iced tea. The mango is great! That cake looks amazing! I could a slice or three right about now. I love a good green tea, so that would be my preference. I like both you and mighty leaf on facebook. I’m following both you and mighty leaf on twitter. I’d like the black tea with just some lemon slices added to it. I like black iced tea! On a separate note: I so enjoy reading your updates but would like to be treated to see (more) pictures of Isabelle too! Just wanted to thank you for the sweet note! That’s so funny because I had gotten another e-mail from someone else complaining that my blog was turning too personal and they wanted to see more desserts! To each their own, but I’m glad you enjoy the photos of Isabelle! Ginger Peach all the way. Liked both you and Mighty Leaf on FB. Like Mighty Leaf and your blog on FB. mango would be the flavor I would pick. I adore mango, so Calypso Mango would have to be my fave! I usually go with green tea, but that Calypso Mango sounds AMAZING. I liked both pages on FB. Green for sure! Actually, I like all tea, I’m such a sucker. Definitely prefer Black Tea and love to add flavored black tea bags or fresh lemon! Lovely recipes and photo. I can’t wait for peach season to arrive later this summer. Before reading this I planned to experiment making this type of almond pound cake with the additon of basil. Probably in the form of organic basil essence but the leaves themselves could be ground in with the sugar. We shall taste and see. I love the sound of a cold glass of ginger peach tea! I dont think you can go wrong with black iced tea! I’ve liked Dessert First & Mighty Leaf Facebook! I’m now following Dessert first and mighty leaf on Twitter! The crumb on this cake looks amazing! Black tea–the bolder the better! Calsypso Mango all the way! Liked the Mighty Leaf Canada page on Facebook! I have liked you on fb and mighty leaf too. I started cold brewing big batches of green tea a few weeks ago, so now I always have concentrated tea sitting in the fridge. Yum! ooh that ginger peach sounds good! thanks! 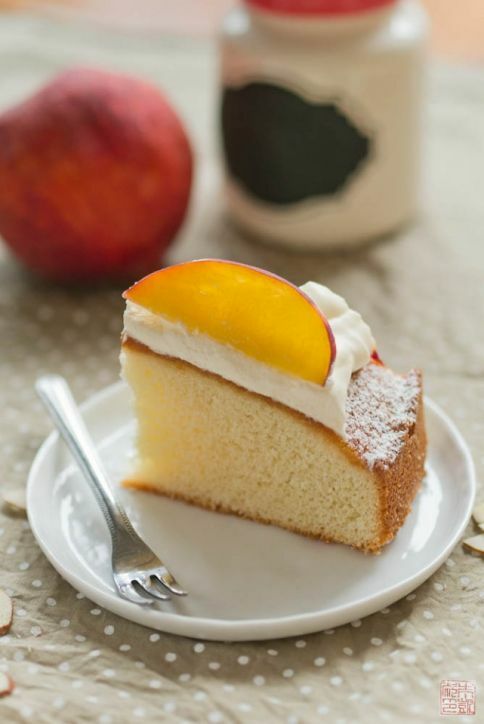 Peach ginger & Calypso Mango with the Peach Almond cake….. yummy. The Ginger Peach Iced Tea sounds perfect. I follow Dessert First and Mighty Leaf on Facebook. Hi! This cake looks amazing! Is it possible to make it in a stand mixer with a paddle attachment (or another attachment?) instead of the food processor? I think you can make this in a stand mixer with the paddle, although it might be harder to break up the almond paste and mix with the sugar. Make sure the almond paste is fresh and soft – if it is hard it will be difficult to break it up with the paddle. Happy baking!